Of 15 pictures currently in roadshow release or scheduled to open before the end of the year only seven — less than half — were photographed in 70mm. And the number of 70mm prints available to exhibitors of even those few is extremely limited. This has been distressing news to the owners of the 750 to 800 domestic theatres who have gone to the expense of installing the expensive projection equipment for 70mm. A majority of them are having to be content to use 35mm prints — magnetic ones if they are lucky and optical if they are not. In most cases there are only from 40 to 60 of the 70mm prints in supply, which means only one or two for each of the exchanges in the country. For the rest there are about 100 of the 35mm magnetic prints (which can handle three screen speakers and auditorium "surround"). And then there are 100 "straight" 35mm prints which means no "stereophonic" effect at all. Is the audience which is lured to the theatre by the promise of "full stereophonic sound" to go with the huge screens aware that it is being "cheated?" Probably not. Some sound specialists point out that the difference between 70mm, six-track sound and four-track 35mm magnetic is so slight only the most skilled of engineers can detect it. They further observe that the failure to exploit "stereo" sound properly is a general one — attributable both to filmmakers who were slow to use "surround" effects and to the exhibitors who didn't bother to install the side-wall auditorium speakers. As a result this technique has generally fallen into dis-use. Possibility of a return to a general magnetic system is also viewed as remote. It has been years since three-track prints were put out on a regular basis. Only two film companies — MGM and 20th-Fox — have current roadshow films shot in 70mm and with the larger prints available. MGM has "Doctor Zhivago" and "Grand Prix" (the latter shot in Super Panavision and being "presented" in Cinerama). A company spokesman said there are approximately 70 of the 70mm prints available for each. 20th-Fox has "The Bible" (in Dimension-150) and "The Sand Pebbles." No information could be secured on just how many 70mm prints are now in use. MGM will have two more roadshows this year - the reissue of "Gone with the Wind" and Stanley Kubrick's "2001 - A Space Odyssey." "Wind" is, of course, an enlarged version of the original 35mm master print, blown-up frame by frame. Sound has also been re-recorded for six-speaker use. The company expects to have about 70 prints of each of these pictures as with its two present roadshows. In December 20th-Fox will release "Doctor Dolittle" in 70mm, but again the number of large prints to be supplied could not be ascertained. As for the rest of the 1967 roadshows, they were shot on 35mm films and are naturally being projected that way. This includes Walt Disney's "The Happiest Millionaire," set for openings in June; Columbia's "A Man for All Seasons" and "Taming of the Shrew", now in release; United Artists' "Hawaii" and "Marat/Sade" now playing in key situations; Universal's just-opened "Thoroughly Modern Millie" and Continental's "Ulysses." To the surprise of a great many in the industry Warner Bros.' "Camelot," now in production, was shot in 35mm. too. Its first dates will take place late in October. Your bleak assesment of prevailing 70mm conditions seems well-taken, and you are to be congratulated for raising the problem in the pages of THE HERALD. As a theatregoer with a passion for motion picture film, let me offer the following personal observations. There are five active 70mm houses in Toronto, two of which are now showing 35mm films — "Hawaii" and "Man for all Seasons." The scarcity of roadshow houses has necessitated remodelling of what were "neighborhood theatres" to serve as first-run, reserved seat centres. The "nabes," of course, are not equipped for 70mm presentation — so "The Bible" and "The Sand Pebbles" are being shown here in 35mm, the latter with, apparently dubious projection equipment: I saw "Sand Pebbles" five days after it opened, and the print was already grained and pitted. My guest observed that "after five days the print is scratched, but after two years the 'Sound of Music' print is 'clean'". The newspaper layouts for "The Bible" echo the displays in the theatre itself — displays which observe that the picture was "Filmed in Dimension 150". An observant and snarly woman behind me noted at intermission, "These new processes are for the birds. Dimension 150? Pooh! CinemaScope is CinemaScope is CinemaScope." Her husband agreed "Who do they think they're kidding?" The confusion is not unique, as we shall see. The University Theatre is showing "Hawaii," the 35mm print blown up for the 70mm screen. The distortion and "fuzziness" ruin the film's impact. Of course, the audience in not aware — or is it? One fiftyish matron (who liked Elmer Bernstein's musical score) complained to her friend that the screen for "My Fair Lady" [shown in 70mm at the same theatre] had been so "clear," and that "Hawaii" had been so "fuzzy". She was relieved when the friend agreed, because that meant they did not require glasses! The Glendale Theatre here is the Cinerama House, but it has shown films like the Nureyev-Fonteyn "Romeo and Juliet" and "Is Paris Burning?" both of which are 35mm, both of which were blown up on the huge screen with predictable results. The lack of compensatory lenses may be sound economics, but I doubt it. A relative who saw the Nureyev film has been moaning ever since about the theatre's "terrible screen." She will not return, despite my explanations of lenses, even for "Grand Prix" and Cinerama. The confusion continues when after-roadshow engagements of such as "Lawrence of Arabia" or "My Fair Lady" are advertised "Panavision 70-Color" and not "Panavision-Color." Such conscious or unconscious deception leads patrons to expect to see the film involved in 70mm, and when he sees the 35mm print (whether he knows it is a 35mm print or not) the reactions are either bitterness (over the deception) or superciliousness (through ignorance). How often are we 70mm roadshow addicts told that we can see "the very same thing" if we just wait till the picture comes to the "nabe" — after all, look in the newspaper? Has the motion picture industry ever undertaken to educate its audience into the subtleties of photographic processes, of differences in projection and in sound? At times confusion may be profitable, but it may well be self-destroying. Individual producers, producing companies and distributors (and even theatre managers) have yet to champion 70mm as the photographic miracle it is. It would seem to be time to start a campaign within the industry and with the public to assert the paramountcy of 70mm film and stereophonic sound. Friends in London (Ontario) had seen "Sound of Music" and assured me that they had seen a 70mm print. I knew the theatre, and was not convinced. I took them our Eglinton, and they reacted to the 70mm presentation with shock and delight. "It's like a different picture!" 70mm and stereophonic sound made the difference. It may be cheap economics to grind out 35mm prints for 70mm films; it may be cheap economics to grind out 35mm film for pictures with obvious 70mm "stature." But what will be the impact on the industry if such aborted vision continues? What if a segment of the audience decides that 35mm roadshows are redundant and awaits the booking in the nearest "nabe?" What if a segment of the audience equates fuzzy projection with a fuzzy industry, and drifts back to The Tube? What of professional standards, of the recognition that film is serious business, that students are studying individual films as they study individual books — as literature, that the photographic process can be as important as the casting? What of Art and what of Leadership, when the leaders of the industry refuse to lead, when they refuse to use the techniques at their disposal to make an individual film a work of photographic art? The industry itself can answer the questions, for it must know that 70mm and stereophonic sound will not make a film great. But it must also know that they can make a great film unforgettable, and that, surely, is what Art is all about. -Gordon McLennan, graduate student (Modern History and English), Victoria Collage, University of Toronto (Canada). By John F. Cottingham, Manager, Glendale Cinerama Theater, Toronto. In your issue of May 10 (page 15) you printed a letter from a Toronto theatergoer, Gordon McLennan, graduate student of Modern History and English, University of Toronto. 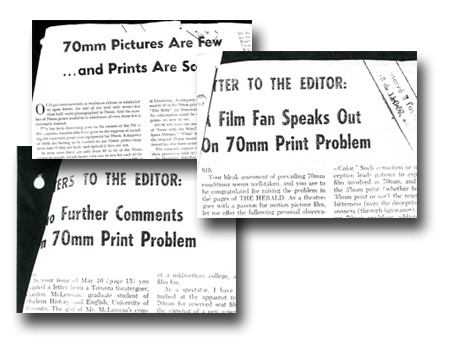 The gist of Mr. McLennan's comments is to the effect that filmgoers are being shortchanged at roadshow houses when 35mm prints are used instead of 70mm. As manager of a Cinerama situation, I would agree that there are certain attractions playing hard ticket theaters in 35mm which deserve 70mm presentation. This is especially galling to theaters who have installed expensive 70mm equipment and then find that they cannot obtain 70mm prints of major attractions. However, Mr. McLennan's comments specifically about our operation at the Glendale are so far from fact that he is in serious danger of losing his amateur status as a critic and being reclassified as a professional. His statement that the Glendale played "Is Paris Burning?" in 35mm is a misstatement based solely on his own assumption. Paramount supplied the Glendale with a 70mm print which was used at each and every presentation. Paramount will no doubt be very glad to verify this fact. As is well known "Is Paris Burning?" contained considerable newsreel footage which added authenticity to the film. Apart from this library footage the 70mm print we used met every normal standard. Mr McLennan also tries to convey the impression that we presented the 35mm feature "Romeo and Juliet" blown up to fill our 60-foot screen. Even in his enthusiasm to make his point Mr. McLennan might be expected to mention the obviously pertinent fact that we masked down a major portion of our large screen using only that part which could be filled with an image of acceptable quality. Mr. McLennan makes a great issue of "fuzziness" in screen presentations. I reluctantly accept him as an authority on "fuzziness." - John F. Cottingham, Manager, Glendale Cinerama Theater, Toronto. I am writing in regard to the article entitled "70mm Pictures" in the April 12 edition of the MOTION PICTURE HERALD. I had planned to write earlier but put it off until reading the most interesting letter form the graduate student in Canada. I, too, am a graduate student in History, in my case at a midwestern college, and am an avid film fan. As a spectator, I have been most disturbed at the apparent trend away from 70mm for reserved seat films. I look upon the viewing of a new reserved seat film as an important event, much in the same category as seeing a Broadway play or attending a concert by a major orchestra. Because of the prices charged for a reserved seat film performance, I expect something special when I enter the theatre. 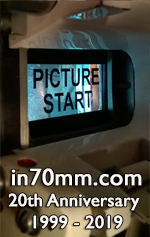 The 70mm process, with surround stereophonic sound, in a theatre designed specifically for such a projection system, adds incalculable scope to a large budget, excellently produced motion picture. I am situated in a rural community located one hundred miles from Omaha, and fifty miles from Sioux City, Iowa. Omaha has four theatres equipped with 70mm equipment, with two of those designed specifically for wide screen, reserved seat presentations. Sioux City has a recently remodeled neighborhood theatre which began a reserved seat policy two years ago with "The Sound of Music," and is equipped with 35mm. I prefer to drive to Omaha to see a film in 70mm when possible. And many, many others from this area drive to Omaha to see a film in one of its wide-screen, reserved seat theatres. But, the point is, why should one pay reserved seat prices for a 35mm film even if the theatre is only a few blocks away? One can always wait and see the film in a neighborhood theatre at reduced prices. And the public is eventually going to become wise to the 35mm "economy measures" of the roadshow film producers. I saw "A Man for All Seasons" a few weeks ago at one of the wide-screen theatres in Omaha. It was projected on the full height of the screen, and, in some scenes, the effect was horrible. The picture was often terribly blurred. As I intimated previously, I seriously doubt whether I will again pay reserved seat prices for a 35mm film. It just is not worth it. I am most happy that Mr. McClennan questioned the advertising procedures regarding 70mm films. In addition to the points he presented, I would like to ask. Are "Doctor Zhivago" and "The Sand Pebbles" available in 70mm or are they not? Both are advertised as being in "Panavision," which is descriptive of the 35mm process. Your article states that both are available in 70mm. I purposely neglected seeing "Doctor Zhivago" in Omaha because I assumed it was in 35mm. Since M-G-M is making the 70mm process a major selling point in its campaign for "Gone With the Wind," why did they not do the same for "Doctor Zhivago" if it was, in fact, in 70mm? I did not realize that some reserved seat theatres equipped for 70mm were unable to obtain 70mm prints. According to the 1960 census, fifty U.S. cities had populations in excess of 260,000. Realizing that wide-screen theatres have recently been built in many cities in the 100,000 population class, it is obvious that seventy 70mm prints are not enough. I have one major criticism of your article. The presentation would have been much more forceful had you refrained from mentioning the films "Marat/Sade" and "Ulysses." No one could logically argue that they should be made available in 70mm. You also could have mentioned that films such as "The Blue Max" and "A Man for All Seasons" were not originally intended as reserved seat attractions. But obviously there is no excuse for films such as "Hawaii" and "Camelot" not being filmed in 70mm. Editor's Note: We did not propose that "Marat/Sade" and "Ulysses" should have been in 70mm. We simply listed them as current roadshow pictures.